Your day is already full. You and your team are busy. Working together. Accomplishing goals. Putting out fires. So, when your calendar appointment pops up, reminding you of a volunteer activity or business-networking event, you may find yourself wondering if the time could be better spent elsewhere. 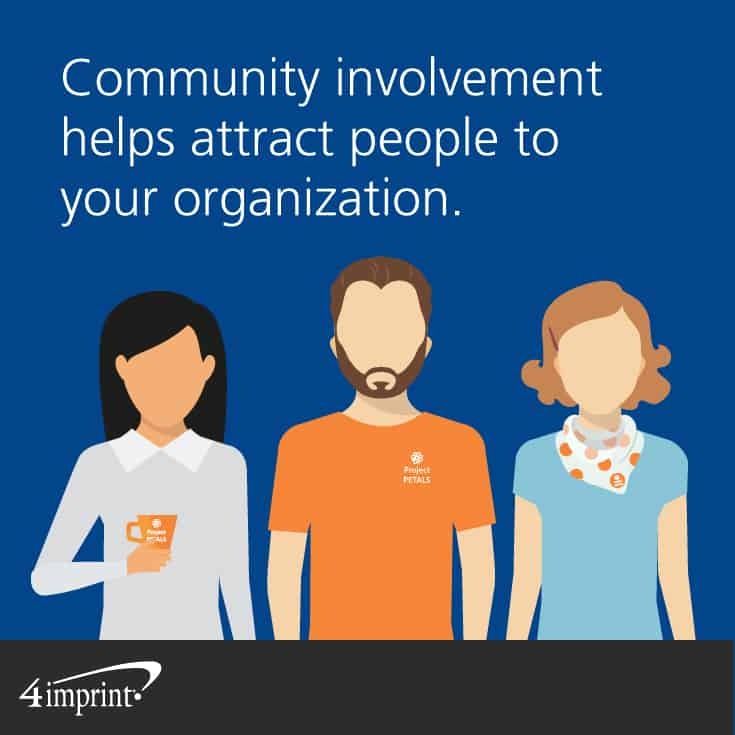 Yet, this Blue Paper will show how community involvement can be a strong pillar of your business growth strategy—community connections help you build business relationships. In fact, research shows community involvement, such as sponsorships, networking events and volunteerism, draws attention to your name and helps forge lasting relationships with customers, future business partners and prospective employees. Promotional products provide a creative way to jumpstart those valuable relationships. Participating in community initiatives is a powerful way to network, raise brand awareness and build relationships that grow your business. Research underscores the strategic impact of this work. A study by the Boston College Center for Corporate Citizenship found that community involvement is a key contributor to primary business goals like building a positive reputation. More than that, involvement can help attract the right people to your brand while strengthening your community and creating goodwill. PACE Coalition is a publicly funded, non-profit community health organization based in Elko, Nev. Promotional products played a key role in the coalition’s community involvement initiatives by building their reputation and helping develop relationships in its service area. That’s important. Its mission is to create a healthy community through substance abuse prevention, wellness programming, nutrition education and parenting support. Building relationships enables them to get their resources to their key audiences. To reach that population, PACE Coalition participates in health fairs and service clubs. It also gets involved with veterans’ organizations and sponsors events like the recent, regional “Clean Up, Green Up” Earth Day event. The PACE Coalition also hosted events, such as a recent child safety seat giveaway. Promotional apparel, such as the Harriton 5.6 oz. Easy Blend Polo gives their organization visibility throughout the events, raising their profile among key audiences. And, promotional giveaways play an equally important role, helping start conversations with community members. “It’s very important to have quality giveaways. For me it has to interest me before I put that on my table” Oslund says. Since the organization is based in the desert, Oslund says they’ve found lip balm and water bottles are reflective of their mission and are well received by the public. In addition, she says custom notebooks are an extremely useful giveaway during the training programs they hold for law enforcement and emergency responders. “That’s something that they’ll make good use out of, not just something that you put on the side of a desk or in a drawer and never look at again,” Oslund said. 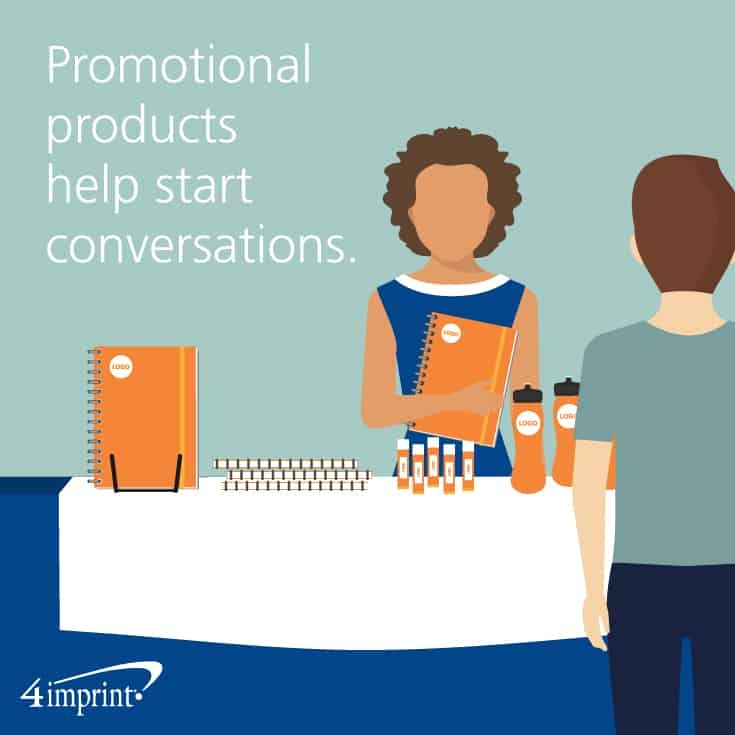 In this way, promotional products not only serve as conversation-starters, but also of brand-awareness builders. They keep your organization’s name in front of the people you want to reach. Promotional products also serve as a reminder of the important products and services you provide. It’s likely your organization embraces one or more of these options in some way. That’s good. But if you aren’t making your brand visible, tangible and memorable in some way through these interactions, you’re not building business relationships. If you don’t tell people about your involvement, they won’t know you took part in the community event or effort at all. But before we dive deeper into how to make a statement, let’s consider how to select the causes and charities you will support. “Sponsorship marketing: Five Criteria for Success” says if attendees, volunteers or fellow sponsors aren’t among your key target audiences, it might be best to pass on the event. But if you know the population you’ll be reaching represents a strategic growth area for your business, or if you’re hoping to build a relationship with event organizers, the sponsorship opportunity may be right for you. Next, you’ll want to look at whether the event or opportunity will create a positive experience for your key audiences, according to “Sponsoring an Event? Tips to Maximize Your Return” from www.inc.com. Think carefully about how attendees will feel about the event itself. Consider the kinds of feelings they’ll associate with your organization if you sponsor the event or volunteer at it. If the event reflects the mindset and culture you want associated with your brand, jump on board. The final step in deciding whether to move forward with a networking or sponsorship opportunity is to look at the details. You want to be sure you have a full understanding of what your organization will be expected to provide and what your organization receives in return. As a sponsor, you may be asked to provide financial support, volunteer hours, in-kind gifts or donations, or even event giveaways. In return, sponsors often are featured in print advertising, showcased on logo’d t-shirts or mentioned during announcements at the event. “Marketers, This is How To Choose Events To Sponsor” advises partnering with event organizers who understand that you are approaching community involvement with a goal in mind. While sponsorship packages may be pre-determined, often organizations or event sponsors will be willing to negotiate or create a package especially for your organization. Perhaps you’d like your sponsorship to include volunteer opportunities, which also can be a team-building opportunity for employees. Or, perhaps you’d be willing to increase your financial contribution if it meant your organization had the opportunity to network with or introduce a particularly influential speaker in your industry. Be creative! The possibilities for making community involvement a win-win are virtually endless. Once you’ve selected the right community involvement opportunity for your business, you want to make the biggest impact possible. Promotional products can play a key role. Most event sponsorship opportunities come with a number of chances to get your brand in front of key audiences. Take advantage of those opportunities! If you’ll have a pre-race booth, add an eye-catching tablecloth or banner to showcase your organization and create an inviting opportunity for audiences to engage with you. Offer a grab-worthy giveaway that audiences can’t wait to get their hands on. It’s just one more way to let your key audiences take a piece of you home with them. If your team will be participating or volunteering, outfit them in branded athletic apparel. That’ll make them easy to spot, give exposure to your brand AND build team unity. Consider providing customized race supplies like mile marker balloons or swag bags. Set up a themed water station along the racecourse. When you make run/walk participants smile mid-race, they will remember you. 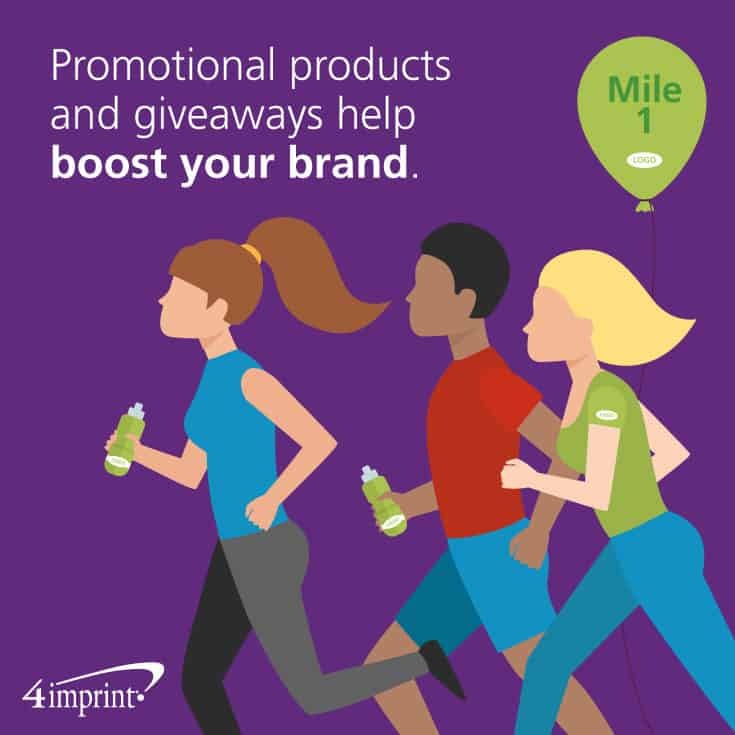 When you sponsor a community 5K, 10K, half-marathon, marathon or other race, walk or fun run, you give participants the chance to see your brand for miles. Getting involved in a nonprofit organization’s fundraising event is one of the easiest ways to make a difference in your community. Best of all, you’ll know you’re doing something good for others. For many events, silent auctions and door prizes offer are a way to raise funds for a good cause and highlight event sponsors. Once you’ve decided to participate in an event, be sure to brainstorm giveaways that your audience can’t resist. Consider donating a basket filled with custom promotional products for an auction. To make the biggest impact, select giveaways that are a good match for the event crowd. If it’s a golf event, for example, create a golfer’s basket with a custom golf towel, logo’d golf tees and custom golf balls. When your branded door prize or silent auction donation really wows, you’ll make a great impression on attendees as well as the lucky recipient. The key is to give gifts that not only showcase your name, but are also useful to the winner. Every time they pick up one of the products, they’ll remember your brand. If you’re participating in a health fair, business expo or community tradeshow, promotional products provide a way to get your name in front of all event attendees. Create a custom event giveaway for all participants and hand them out at registration or in the event’s swag bag. Stock your exhibit with unique promotional products that will draw attendees to your booth. Offer a few higher-value items for hourly giveaways or drawings. In this case, your brand will not only go home with attendees, it will also be announced as a supporter of the event every time there’s a winner. Whichever approach you choose, forge relationships by giving valuable coupons, providing online opportunities, offering free services, or having a sign up that allows you to get contact information and follow up at a later date. Doing so gives your target audience a reason to reconnect after the event is over. By now, you know how important community involvement is for relationship building. What you may not know is that community involvement can give your business a boost in other ways, namely employee recruitment and retention. 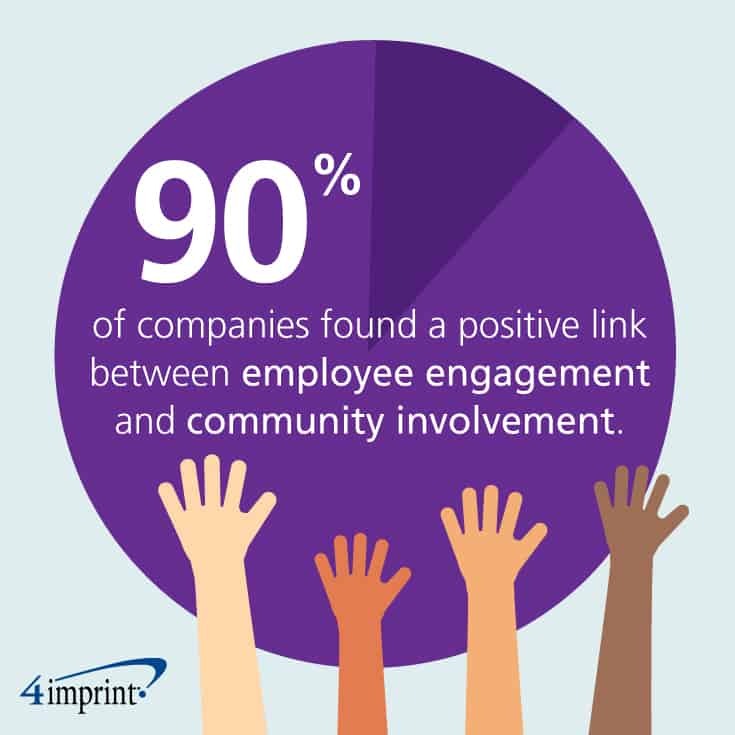 The study conducted by the Boston College Center for Corporate Citizenship showed that 90 percent of companies that tracked the relationship between employee engagement and community involvement participation found a positive correlation. Likewise, a PriceWaterhouseCoopers report showed that 86 percent of Generation Y job applicants would leave their organization if the company’s community involvement, also called corporate social responsibility, program started to falter. The bottom line: Employees want something they can believe in, and they want to be a part of a mission that extends to community involvement. So while you’re seeking community involvement to make a difference for your business and your community, you’re also making a difference in the lives of your employees. Organizations benefit from community involvement in many ways: increased awareness of the brand, product or services, improved employee engagement, and an elevated reputation. The community benefits, too. From a business perspective, the biggest return on investment in your community will likely come from the meaningful connections you make. “It’s all about more and better and stronger relationships,” said Oslund. When it comes to your organization’s longevity and growth plans, the relationships you build through sponsorships, volunteerism and community involvement are almost endless. So, get out there and get involved!